The current certified agreement commits to a review of the classification structure of promotional positions, taking into account school complexity and the impact of needs-based funding/staffing, which will inform negotiations for the next certified agreement. 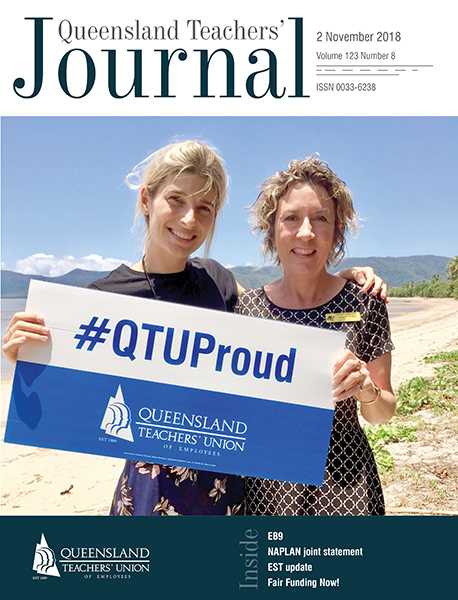 Consequently, the QTU seeks to include a revised classification and salary structure for classified positions in the new agreement. The QTU aims to retain and strengthen the measures included in the current agreement to mitigate workload, with the addition of a structured audit of workload impacts, including initiatives and proposed changes to work practice at systemic and workplace levels. This review must include consideration by the ECC and LCC (in schools required to have one) before any initiatives or changes that impact on how work is performed are implemented. a review and establishment of class size targets for practical subjects. Non-contact time – including an increase to non-contact time provisions in all school settings, to enable professional activities including collaborative planning, moderation of student work and the implementation of the Australian Curriculum and the new QCE. Part-time teaching – including improved access to part-time for teachers and those in promotional positions, and recognition of service for salary progression purposes. Incentives for rural and remote locations – including implementation of the changes to the scheme arising from the pilot undertaken in the current certified agreement, an enhancement to the levels of compensation and incentive payments (including linking this remuneration to salary increases or CPI), and the introduction of attraction incentives in rural and remote locations. Permanency – including a commitment to ensuring temporary employment only occurs in circumstances of a short-term vacancy (including IPS), and improvements in the teacher transfer and promotional position relocation processes. Allowances – ensuring allowances applicable to the public sector, such as on-call allowances and higher duties, are adopted appropriately to reflect the work undertaken by teachers and school leaders in schools. Professional issues – a review of joint statements to include the dispute resolution processes of the certified agreement or award and commitments to negotiate joint statements from time to time in response to professional issues that emerge through DoE initiatives or other expectations. Workplace health and safety – including support and release time for members undertaking the roles of WHS representatives and officers to allow them to perform their duties and undertake training, and improved processes to mitigate circumstances of occupational violence (including online behaviours) and WHS risks to wellbeing and safety. Release time for Union Reps to undertake their role on the LCC and other duties. Fatigue time or TOIL provisions for additional duties undertaken outside regular hours of instruction that are required as part of the teaching role. Review of senior teacher and EST salary progression processes and access. increases in other education sectors in Queensland. Members should note that current government wages policy (2.5 per cent p.a.) will not be enough to achieve real salary growth by the end of the agreement (looking at projected CPI alone).